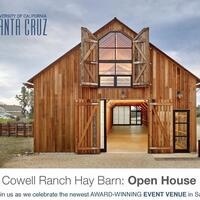 On Sunday, March 19, take a tour and get information on renting the award-winning Cowell Ranch Hay Barn at UCSC. The Open House takes place from 12 pm to 4 pm. This free event will be particularly useful for event planners, wedding professionals, and others interested in seeing and learning more about this unique campus and community space, conveniently located near the main entrance to UCSC, with sweeping views of the Monterey Bay. Free parking will be available both at the Hay Barn and across the street at the corner of Coolidge Drive and Carriage House Road (a 5-minute walk from the Hay Barn). RSVP Heidi Harris, Event and Marketing coordinator, at hharris2@ucsc.edu, 831-459-3762.